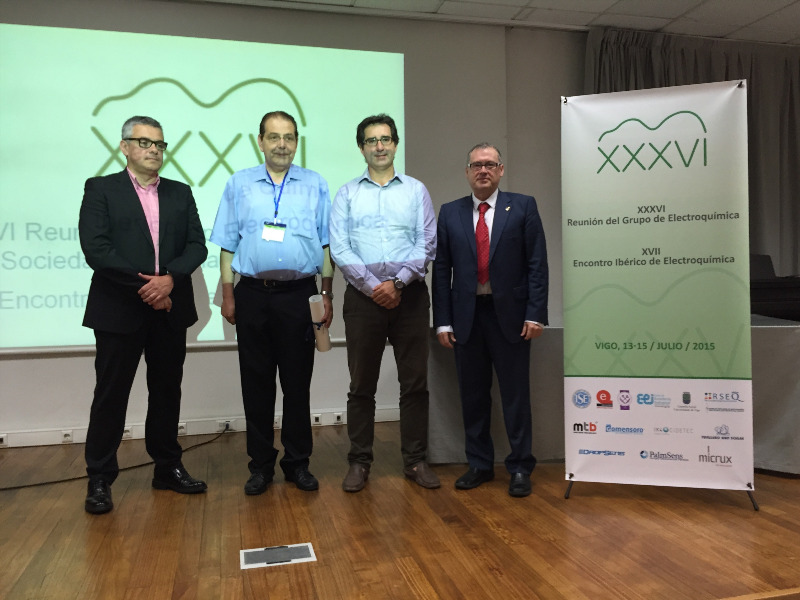 The ceremony took place within the framework of the "XXXVI Meeting of the RSEQ Electrochemistry Group" held in Vigo between 13 and 15 of July 2014. Dr. ENRIQUE BRILLAS COSO, Professor of Physical Chemistry at the University of Barcelona, was awarded 6000 euros, a trophy and a diploma for CIDETEC 2014 Award in the "Scientific Career" mode. Moreover, the CIDETEC 2014 Award in the category “Scientific Research in Electrochemistry”, worth 4000 euros a trophy and a diploma, given to the research conducted by the research team of Instrumental Analysis at the University of Burgos, was received by Dr. ÁLVARO COLINA SANTAMARÍA, representing the team. The CIDETEC awards have become a benchmark for excellence in Spanish electrochemistry and a hallmark of the activities for the specialized group of Electrochemistry in the RSEQ.